I made this card for a site that I just love. I also get to design cards for them which is super sweet! Be sure to check out Card Annex when you get a moment. There is a new card each day and the site is quite easy to navigate, so you can always find inspiration. My papers are from the MME Lost & Found Blush 6x6 paper pad and my image is from Nellie Snellen. 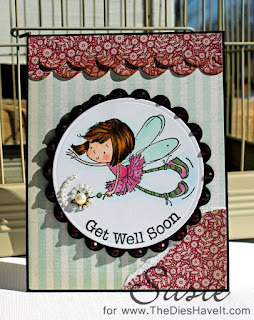 My top border is cut using the scallop die from MFT Stamps. I love using two or three strips together on a card. I used Spellbinders dies to cut the focal image and mat. Adding bling was my final step and then I called her DONE. Be sure to come back tomorrow. I have another fun card to share with you. What a cute card!! Adorable!